In the ring, Regan has control. Outside the ropes, she fights to survive. Regan Sommers spent her life fighting. Fighting foster parents, kids in the group home, and classmates. But the night she has to fight for her life changes everything. Now, she's fighting for money in the ring, and from the first punch she's addicted. Every addiction has a price though, and this one is the gym's star boxer, Gage Lawson. He may come in an enticing tattooed package, but his demands are more than she can handle. The responding officer from that night, Anthony Fields, comes with no demands. He wants whatever she's willing to give, and Regan can handle that. She can definitely handle him. But no help comes string free, and Regan's not the only one with a hard past and scars to cover. The life she was trying to escape is nothing compared to the danger she's in the middle of now, and she can't fight her way out. I'm always dubious reading a debut authors book, past experiences where I couldn't connect with the author or writing has really put me off reading debut them, but I always like to give any author a chance and this dragged me in just from the blurb and cover picture and I'm so glad I went for it. Ashley is a new author to watch out for, I couldn't put this book down I love it and Ashley is defiantly a future author to keep a watch on. 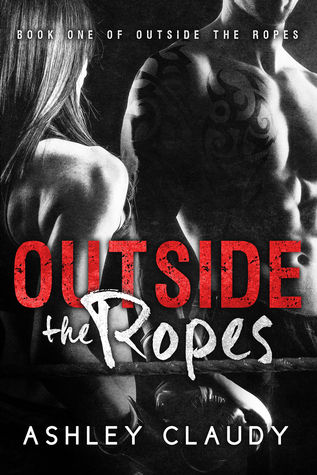 Outside The Ropes is a fresh and different take on the typical fighter story and is a real gripping and raw throughout. A detailed deep and emotion debut edgy novel, I can't wait for the next.